Almost every Saturday morning, Beau places a cup of coffee on my night table and tells me it's Yard Sale Saturday. He then turns on the light and proceeds to read his newspaper. Usually, by 6:40am, I manage to climb out of bed and start getting ready. Getting ready is easy, clothes, teeth, hair, drink rest of coffee, collect money and back up tote bag (cell phone, measuring tape, billfold), put on the MP3 player and out the door right about 7am. And, so it went today, except I forgot the MP3 player. Visited 8 sales in all; The Lakes, a local subdivision was having its annual. a container for crayons. I certainly don't need anymore crayons. I haven't finished making the heart crayons I started last weekend for Lilly, but I really like these small lidded containers and for a dime, what the heck. A box of foam stick on letters. Thought these would be fun to add to my packages mailed from the supply shop ... words, or at least letters, on mail kinda thing. A really long chain that was probably some kind of belt. 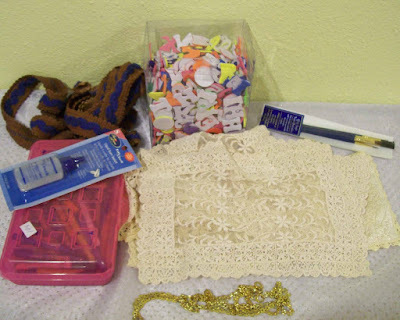 14 pieces of antique lace and/or crochet thingies. The antique lace/crochet was interesting. At one of the sales there was a rather large stack on a table with no price. I asked the woman for cost and she came rushing over telling me how they were antiques and really special. I reminded her that one persons antique was another persons used, unwanted stuff, to which she quickly decided the small pieces were a quarter and the larger 50 cents. I must have spent a good 45 minutes going through them all, and in the end selected 14 pieces. I envision them as texture under paint on canvas. I thought about offering her $10 for all, but truthfully, I'd selected the ones that I thought had the best potential and the rest would just be inventory. I'm sure I'll regret this decision. Oh well. I think you got a good deal on the lace stuff!